The Hausa City States were independent political entities in what is now northern Nigeria. The first of the states, Gobir and Rano, emerged around 1000. All of the states remained independent until they were conquered by the Sultanate of Sokoto between 1804 and 1815. The Hausa city states emerged as southern terminals of the Trans-Saharan caravan trade. Like much larger cities such as Gao and Timbuktu in the Mali Empire, these city states began as centers of a long distance trade that included leather, gold, cloth, salt, kola nuts, and animal hides. Hausa merchants in each of these cities collected trade items from the rain forest region to the south, processed (and taxed) them and then sent them north to cities along the Mediterranean. The trade probably influenced political development as ideas (and people) from the Middle East and North Africa made their way south to the cities. In fact the Hausa city state creation myth suggests that northern influence. According to the myth, the city states began when Bayajidda, the prince of Baghdad, arrived in Daura (the oldest of the Hausa city states) and married the queen of the town. 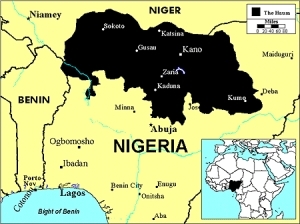 Their seven sons founded the other states of Katsina, Zazzau, Gobir, Kano, Rano, and Biram. Certainly trade influenced religion. By 1200 all of the city states had Muslim rulers. Although each Hausa city state began as a small walled village (birni) of Hausa speakers, trade brought immigrants from the north, west, and east, all of whom were incorporated into these growing urban societies. Both indigenous people and immigrants farmed the areas around the cities, providing food for the urban population in exchange for military protection from nomads and rival political states. By the 1500s Kano had become the largest and most prosperous of the city states. By this point it was a major trading center in ivory, gold, leather, and slaves. Arab and Berber traders resided in the city along with local merchants. It also became the leading center for Islamic culture in the region although it was challenged on occasion by Katsina. At times Kano and other city states attempted to conquer their rivals but none of them had the military or economic capacity to dominate the region. Consequently the city states remained a loose confederation sometimes working jointly but more often as economic and political rivals. That rivalry, however, came to an end in 1804 when Uthman dan Fodio, a Fulani religious leader from Gobir, began a jihad that in eleven years would bring all of the city states into the Sokoto Caliphate. Nearly one century later in 1903 the Hausa city states became part of the British Empire. Today they are major cities of Northern Nigeria. Kevin Shillington, Encyclopedia of African History (New York: Fitzroy Dearborn, 2004); Roland Oliver and Michael Crowder, The Cambridge Encyclopedia of Africa (New York: Trewin Copplestone Books Limited, 1981); http://www.britannica.com/EBchecked/topic/257110/Hausa-states.